Bone: Out from Boneville Game Review - Download and Play Free Version! 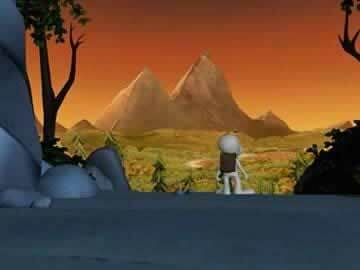 Based on the best selling comic series - help Bone on a mysterious adventure through a valley of incredible creatures. A mysterious foe. An idyllic valley. An unlikely hero. Enter the world of Jeff Smith's Bone and a truly epic adventure will come to life! In Bone: Out from Boneville, the first episode of the epic Bone saga, three cousins - Fone, Phoney, and Smiley Bone - become separated in a vast, uncharted desert. One by one, they find their way into a deep, forested valley filled with wonderful and terrifying creatures and new mysteries that await them. 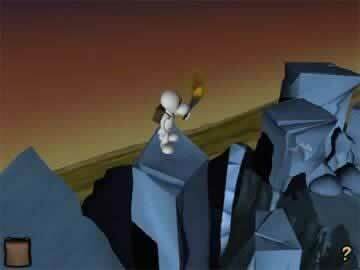 Out of Boneville, the first in the saga of Bone games, is an easy to learn point-and-click adventure following Fone Bone and his wacky cousins through an unfamiliar valley in search of their hometown Boneville. Unfortunately, Bone is far more simple than adventurous. The plot itself is hardly inspiring and is much too simple to create any real enthusiasm for the game. In the span of only an hour or two, expect to travel very quickly from the desert into the valley, have only two rendezvous with the rat-like villains, then perform only a few simple tasks that lead you to the end of this game. On your way you meet an ensemble of good and bad characters including the beautiful Thorn and her grandmother, as well as repulsive rat creatures plotting some evil plan in which kidnapping Fone Bone is a vital element! While the dialogue itself is enjoyable and the animation of most characters is commendable, creativity is generally limited and its hard to become genuinely enthralled with this game. Were it not for the dragon and giant leaf bugs, there would be few creative elements to solidify originality. Furthermore, in order to entice you to purchase the second game, none of the “mysteries” set up are even close to solved and when combined with the abrupt ending, no resolve is left for the player upon completion. Only a few mini-games are included and those that are will be too easy to solve for most audiences and are not terribly unique or invigorating. Overall, the extremely short game length combined with the less than exciting plot negates the good dialogue and animation and ultimately this game is overpriced for what its worth. Perhaps recommended to school age children, those capable of keeping up with dialogue, who would enjoy the simple plot and ease of navigation, but on the whole this game is uninspiring and not worth your money. Watch a few scenes from the game.